A celebration was held on 27 March in Plaza Telefónica to mark the anniversary of Espacio Fundación Telefónica. Around a thousand people came to enjoy the show Cantando Aprendo a Hablar (I Learn to Speak Through Singing). 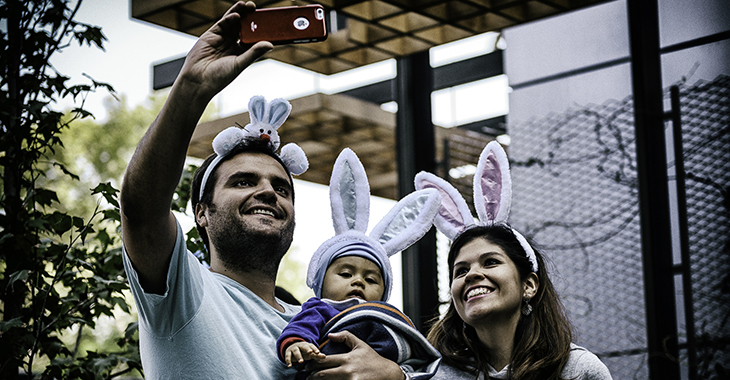 The event focused on the children, who painted their faces and received chocolate eggs, thanks to 25 Telefónica volunteers who worked together to organise the celebration and make it more entertaining. The day started at around 11 in the morning with a group of children and their families, eager to sing and dance. While the performance set the tone for the event, the volunteers defined the details of the day. Plaza Telefónica gradually filled with families at the side of our office at 10 Bustamente Street. Before midday there were around a thousand people waiting to hear the band in the show Cantado Aprendo a Hablar. Finally, the band came on stage to the obvious delight of the children who sang along with every song, in their parents’ arms and on their shoulders, and the parents enjoyed the music too. At the end, after a show which lasted an hour, the volunteers gave out chocolate eggs donated by Arcor so everyone left the party in a very happy mood.